We have learned how to VB2010 can perform arithmetic functions using standard mathematical operators. However, for more complex mathematical calculations, we need to use the built-in math functions in VB2010. 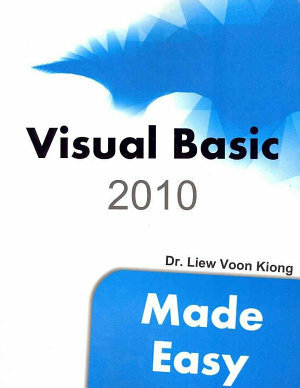 There are numerous built-in mathematical functions in Visual Basic which we will introduce them one by one. The Abs return the absolute value of a given number. *The Math keyword here indicates that the Abs function belong to the Math class. However, not all mathematical functions belong to the Math class. The Exp of a number x is the exponential value of x, i.e. ex . The Rnd function returns a random value between 0 and 1. Random numbers often need to be converted into integers in programming. For example, if we wish to obtain a random output of 6 integers ranging from 1 to 6, which makes the program behaves like a virtual dice, we need to convert the random numbers to integers using the formula Int(Rnd*6)+1. In this example, Int(Rnd*6) will generate a random integer between 0 and 5 because the function Int truncates the decimal part of the random number and returns an integer. After adding 1, you will get a random number between 1 and 6 every time you click the command button. For example, let say the random number generated is 0.98, after multiplying it by 6, it becomes 5.88, and using the integer function Int(5.88) will convert the number to 5, and after adding 1 you will get 6. * The Math keyword indicates that the Round function belongs to the Math class.